Must I have hit an obscure keyboard combination that launches Airport Utility? (I don't think I hit ANY keyboard combination! Let alone an obscure one...). Of course I didn't change any settings and quit Airport Utility. According to OSX' Software Update my software is completely up-to-date. So where do I find info on that firmware 7.3.1 update? 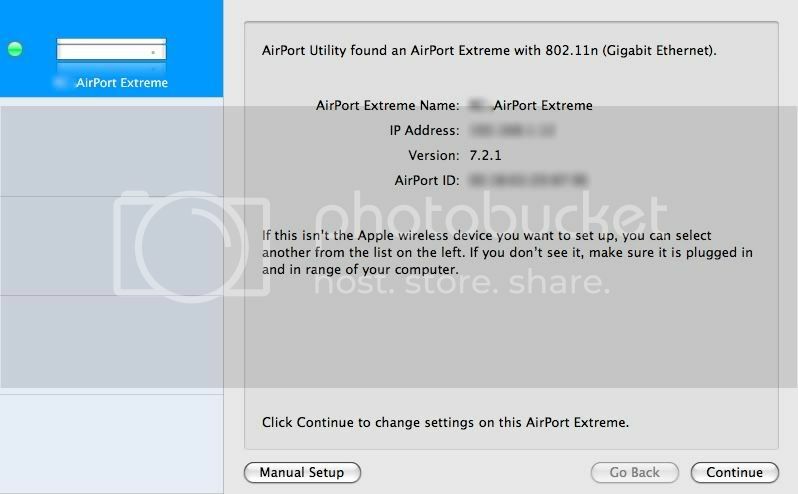 Under Airport Utility in the menu bar use check for updates the firmware doesn't show in software update only via here as far as I know. JUst follow what it says and make sure not to turn it off whilst it is running the update it will reboot when finished. It can take a few minutes to fully update the firmware. It's prolly too early to have noticed speed gains, I guess. And I still think it's strange OSX's Software Update scheme doesn't catch that. One thing I do suggest now is to do a hard reset on the airport this will stop any possible dropouts of the connection after the firmware update. Firstly use grab to take screen shots of the current config of the airport. Them hold the reset button until the light flashes oranges a few times and the wait until it restarts and re-do the config. I had problems after the firmware update with dropouts and the above solved them completely for me. Updates for airport firmware have came via airport for quite sometime and seem to work ok that way.